provide correct combinations of keyword, content and landing page. 1. keep the depth as flat as possible, the optimal site's depth is 3 levels. Unnecessarily nested site make the search bot going extra mile and increases the difficulty of getting a proper PageRank. 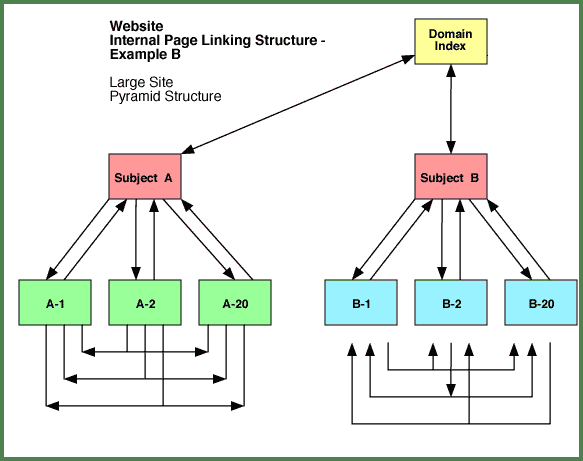 The fewer levels your site build with, the more PageRank will inherit all subpages from the homepage. 2. Build your segments of the hierarchy (category 1 - article 1, category n - article n) based on content to the same topic and on related keywords, optimized from broad to narrow / topical specific. Topically categorized site structure provides user friendly navigation, becomes easy maintainable, and, very important, keeps topical coherency and, therefore, establish clusters of topical relevancy for Google. 3. Interlink the parts and levels of every segments bidirectionally vertical and between items horizontal on the same level, but never different segments and their parts between each other. Topically interlinked content to related keywords gains the topical relevance inside of subsegments and, hence, of the last level items, which are the (long tail) landing pages. Never interlink segments with different topical orientation between each other! 4. 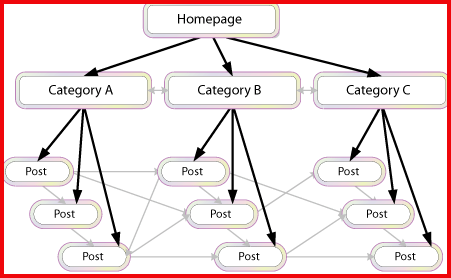 Keep keyword hierarchy: optimize category page for keyword containing max. 2 words, article page - for keyword with min. 2 words. Trying to optimize a page to more the a one single keyword ends up in insufficiently optimized page for all keywords! 6. Only one single menu on a site shall contain dofollow links. Any other navigational elements between content items, like HTML-sitemaps, tag clouds, must be nofollow. If beside of the primary menu any additional navigation element on the site would have dofollow links, it will create additional links to the same content, which are duplicated content. Don't build the site needlessly complicated: one navigation is fully enough and you avoid a bunch of troubles. 7. Furnish links of your primary menu with bookmark and title. It makes them more accessible and qualify these links to be picked up as sitelinks. 8. Sitemap segmentation: create XML-sitemaps for every site's segment and for images. 9. build the URL to the article page like http://domain.tld/article-1. SEO benefits are visible: this URL is shorter, easier to notice and doesn't contain keywords, which don't have to do with the article directly. Duplicated content is the issue, which affect already all, who uses any CMS or blog engine, like Joomla, WordPress etc. The issue is located in the nature of this software. The URL canonicalization and 301 redirect are the techniques to fix duplicated content on the way, which will don't harm your site's SEO. Webmaster tools even provide some possibilities to exclude duplicated content: URL removal tool, URL blocking tool. The best way to block URL from indexing is to use blocking values of meta tag robots in the header of every page, which must be excluded from indexing, so you block URL one at a time. If a set of URLs or a directory is blocked from indexing with a directive in robots.txt, this directive could be ignored, if blocked URL gets incoming links and, as a result, link juice / PageRank. Use meta tag robots for most efficient excluding from crawling/indexing. 12. Exclude from crawling and indexing site's directories containing scripts, design template, auxiliary images, which aren't content images, listed by images-sitemap . Use robots.txt or, better, create an empty index.html inside of blocked directory and add meta tag robots with blocking values. 14. Exclude from crawling with nofollow all auxiliary links like calendar dates, print versions, tag clouds and the like. In ideal, but unachievable case only links containing keywords as anchor text aren't nofollow. In real life it isn't possible, but think and act in this direction. 15. Exclude from crawling and indexing all search result pages. 16. Exclude from crawling and indexing all links to search result pages. 18. Adjust your search filters so, so they perform faceted search with not more as 100 items in the deepest facet. If your site development follows these rules, you may be assured, you've done all the best for your site's architecture and now is the time to have a focus on the next issue. What this means? The order of elements inside of the opening and closing body-tags. Before HTML5 there were only block and inline elements and tables as building blocks. 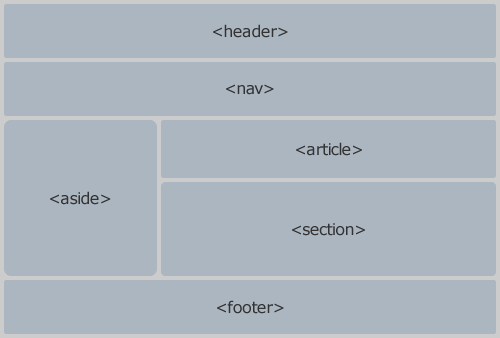 HTML5 brought the semantic structure into the page body: we got such meaningful HTML elements like header and footer, nav and aside, section and article. We can mix them in any unique order we just want. The human eye and the search bot read the page similar but a bit different. The search bot reads straight from top to bottom. This fact is the starting point to think about page-wide architecture. It isn't an objective of this text to tell about user experience, human reading manner and how to design beautiful and readable websites. Instead i'm talking about search bot: how it reads, how ordered must be the page content to ensure, that Google understands fully and exactly, what the content detailedly means. Most discussions about the page content order are from 2006-2011 - at that time this issue was named as "source ordered content", there are already zero fresh discussions to this topic. So what's the point? It is clear, such kind of layout can't harm the site in any way. So it was only discussed, whether and which practical effect this approach brings. The usual elements order in general is: top menu, header (logo+slogan in H1), then the content, sidebar(s) and the footer. Many suboptimal layouted CMS and WordPress templates push sidebars before the main content. So the core of the whole discussion seems to be about the worthwhile of the effort, to order the content accordingly its importance and rearrange it with CSS to achieve the familiar, usual appearance. As i mentioned, the discussion faded away years ago without a clear conclusion and everybody acts for own convenience. And shortly i got another solid reassurance about validity of the consideration, that the search bot ranks in the order of appearance. The search bot ranks the content importance in descending order. begin and end your content above the fold. 19. Directly after opening body-tag comes the block article, with title as H1 and the main keyword-rich content. 20. Below the end of article's text place the header, where i recommend to put, beside of site slogan and logo, a authorship link, some Schema.org-structured contact data using address tag and containing something like address, ZIP code, city and link to the Google map or the geodata of the site. Publishing structured authorship and contact data on each content page near to content makes the best possible local SEO effect: you establish an apparent binding of your content with your location data. If you place any kind of structured markup in such boilerplate elements like header, nav or footer, and this markup is this is the single occurence of structured data on this page (it is a very very very rare case hovewer), it could happen, that the Google structure Data testing Tool doesn't show it up, with a message "unsufficient data to generate preview". It's because Google means, the data structured data isn't the main subject of this page. In our case is this true - we place contact data here only for purpose to show our relation to this page. 21. With intent to build on the page a cluster of topically related content with related keywords place then the section or aside with some (my choice is 3) linked titles and text snippets of most read related articles (not only most read and only related, but both: most read OF the related). The only important thing regarding the elements order is, to ensure, that the search bot on its linear top to bottom moving reads all keyword-relevant content parts contiguously. 22. Now we are ready with our page's content part: place the nav with main menu, where one of the first menu links would be better to the contact page with structured detailed contact information. What helps a visitor on a page, where is no content by the page's nature? It is fully enough to place the nav with the menu, a header with site informations like logo, slogan and contact data, and then a section with some snippets of most read content items. Ensure your pages return correct answer codes: usual content 200, page 404 - 404. I'm aware, that the structure i described above looks a bit unusual, but after small use of CSS the page looks like the human eye uses it to see: top navigation, header with logo and slogan, title and the article text, snippets of related articles and footer with contact data. Further i'm absolutely sure, that not to follow the elements order i described will bring no negative effect, maybe just a bit less of positive. I experimented extensively with other element positioning and what i can say definitely: it is more important, how are page blocks optimized, as how they are ordered on the page. Complying with the instructions be sure your site architecture is proper optimized for search engines.